In my post about Jane Gallion last month, I mentioned in passing that the “pornographic” Essex House imprint published several novels by Philip José Farmer in the late sixties. By coincidence, on my visit to London a week later I saw one of these – A Feast Unknown – on sale in a second-hand shop. 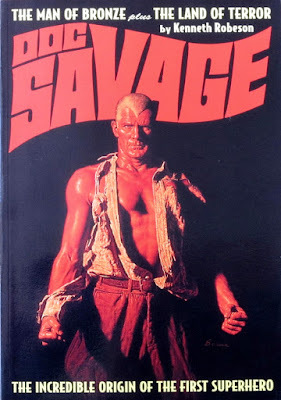 It was only a couple of pounds, and according to the blurb it featured a character based on my favourite pulp hero, Doc Savage, so I snapped it up. This particular copy is a mass market paperback from 1975, with no content advisory or age restriction, so I guess it’s heavily expurgated compared to the original Essex House version. Nevertheless it’s a really good novel – and quite a Fortean one too, with an unusual variation on the “Secret Rulers of the World” theme. 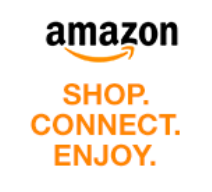 The book is set in the swinging sixties, when it was written. The first-person narrator is Lord Grandrith – an English aristocrat dividing his time between estates in Africa and the Lake District. He’s supposed to have been the “real-life” person on whom Edgar Rice Burroughs based the fictional character of Tarzan, who flourished circa 1912 – 1940. The name that Burroughs used was Lord Greystoke, but in A Feast Unknown Lord Greystoke is merely a near-neighbour of Grandrith’s estate in Cumbria (there is an amusing scene in which Grandrith accidentally demolishes a huge statue of Tarzan, which the locals have erected as a tourist attraction in the village of Greystoke, by crashing an Aston Martin DB4 into it). Although Grandrith is almost 80, he looks 50 years younger – and is likely to stay that way for thousands of years to come – thanks to a Faustian deal he made with a shadowy group of near-immortals called “The Nine”. The oldest members of the Nine are supposed to be at least 30,000 years old, and to have given rise to various legends of pagan gods and goddesses. This may sound like a hackneyed idea, but Farmer’s version struck me as distinctly different – and very clever – in one important way. Normally these manipulative, all-powerful, long-established Illuminati-type groups are assumed to be either (a) extraterrestrials, (b) terrestrial but non-human (e.g. shape-shifting reptilians) or (c) survivors of some ancient but highly advanced civilization from Atlantis or Lemuria. All these theories take a far-fetched idea and convolve it with something even more far-fetched. Farmer’s brilliant twist is to start with that one far-fetched idea (a 30,000-year-old secret society) and combine it with the mainstream academic picture of what Homo Sapiens was like 30,000 years ago. To palaeontologists and anthropologists, that was still the Palaeolithic era, or Old Stone Age. In spite of anything misty-eyed New Agers might want to believe, human society in those days was intensely hierarchical, patriarchal, ignorant, superstitious and brutal. In other words, pretty much the way Illuminati-believers imagine “They” would like it to be today. So put that way, Farmer’s set-up makes a lot of sense. The most shocking scene in the book (one of the most repulsive scenes I’ve ever encountered in a mass-market paperback novel) involves ritual genital mutilation and cannibalism. Yet if there were secret rites dating back to Palaeolithic times, that’s probably the kind of thing they’d be. The narrative adheres to the time-honoured “crossover” formula, whereby the two heroes spend most of the novel fighting each other, before finally realizing they ought to team up against their common enemy (who set them up in the first place). Because it’s told from Grandrith’s point of view, that means that for most of the story the “Doc Savage” character is presented as a bad guy. His very name, Caliban, is taken from the monstrous villain in Shakespeare’s Tempest (for a comic-book version of which, see my post from two weeks ago). Nevertheless, Farmer does eventually explain how such a villainous name got attached to someone who is essentially a “Super Boy Scout”. The shop where I bought A Feast Unknown was 30th Century Comics in Putney. 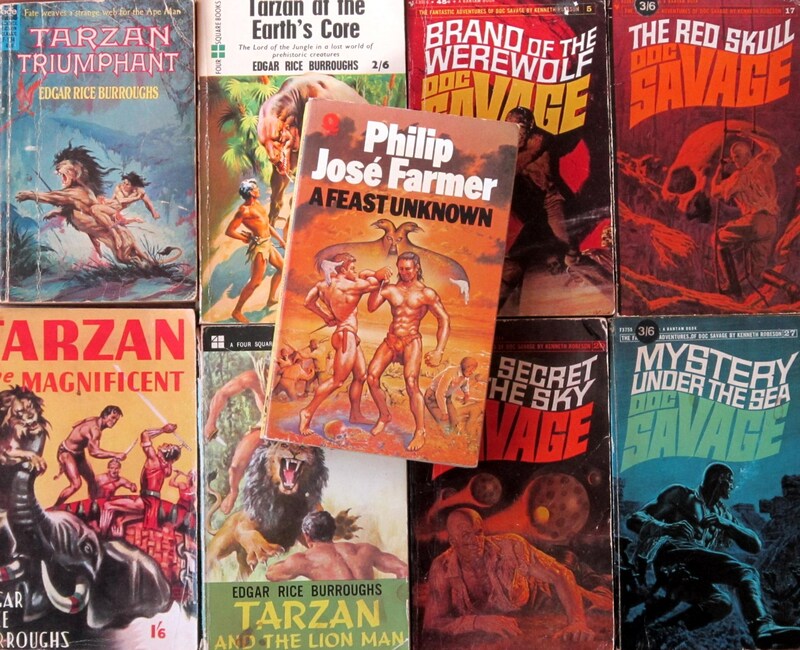 My next stop was The Book and Comic Exchange in Notting Hill, where I bought a reduced-price replica edition of the first Doc Savage novel, The Man of Bronze (pictured below). 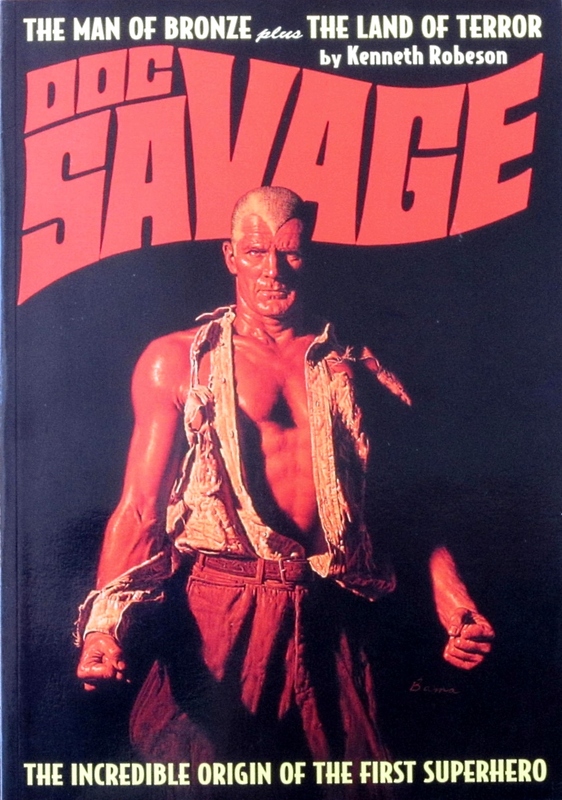 Although I’ve read more than a dozen Doc Savage books, I’d never got round to reading this one – until now! The plot revolves around a hidden city in Central America, where the inhabitants speak the all-but-dead language of the ancient Maya. Thanks to Doc’s enormous erudition, though, he’s able to converse with them in that language. Impressive as that may be, in A Feast Unknown Lord Grandrith (who has a PhD in linguistics from the university of Berlin) goes a step further – he can understand “Ursprache, the parent language of the Indo-Europeans”, as spoken by the 30,000-year old members of the Nine! That sounds a lot more structured than the Farmer books I remember reading/giving up on because they were so meandering and meaningless. I tend to agree, although this is only the third novel I've read by Farmer. Back in the 1970s when I was still at school I read the first two Riverworld novels, but they struck me as rather silly and self-indulgent and I didn't bother with the later ones. In the last few years I've picked up second hand copies of a couple of his other novels (for the same reason as this one - that the blurbs sounded interesting), but they ended up donated to Oxfam without being read. Thanks James - I've read some of the LXG stories, and some books by Picknett & Prince, but not those particular ones, so I will have to check them out! Actually we have no idea how any of the numerous human societies of the Paleolithic were structured. Anyone who claims to know such a thing has an ax to grind and is interpreting insufficient data in light of his or her own worldview. Which is fine - it's the only way any of us can interpret anything - as long as we don't misrepresent our interpretations as anything else, but stand ready to adjust them as new finds are made, and new data are wrung from old evidence. Storytellers have a lot more freedom than archeologists in these matters. Personally I've never read anything by Farmer that didn't leave a bad taste in my mouth. His worldview seems to have no room for joy or innocence or even honest, realistic good intentions. However, if you liked this, you would probably find a search on the term "Wold-Newton" fruitful. Thanks Peni - I'm aware of the Wold Newton thing, but with a few exceptions (this book was one of them) it strikes me as embarrassingly fanboyish and self-indulgent. I take your point about the Palaeolithic, but I think that for an "interpretation" to be valid it has to look at things like skeletal remains (what they say about age of individuals at death, general state of health, diet, physical hardships etc), the sophistication and quality of artifacts and the materials they were made from, the extent to which humans were able to shape their environment (through farming etc), climatic conditions and food supply, etc etc. When all these things are taken into account I think the Atlantean/Lemurian concept of a prosperous, spiritually advanced, peacefully egalitarian society is simply unsustainable. Well, maybe on a continent that has been completely lost to history, but certainly not in Europe, Africa, Asia or the Americas.